Possessing a car for the family is a thought taunting everyone around, but who can buy it is only the matter of money. Rapidly increasing prices and stagnant income level of the fixed salary workers in the country have rendered such a desire only an unfulfilled dream. No doubt, there is a group of successful business people who are getting more and more rich day by day. These are the individuals of the elite class and upper social strata of the society who can get a brand new vehicle of their choice every year and they do so. At the same time, there are a large number of people, belonging to the middle class, who possess a low-end car that may be either a second hand or purchased on installments. If you are working on fixed salary and planning to buy a car for your family, affordability is what matters most for you. So you would definitely look for the least expensive vehicle in the automobile market. There you will find Mehran as the cheapest four-wheeler available. So, instead of buying a used Corolla model, you can go for the brand new Suzuki Mehran. That is why this very brand has made a place in the hearts of the people throughout the country. Being a low end vehicle and, at the same time, powered with the advanced fuel efficient technology, Mehran can be driven with low fuel expenditures. Though seemingly unbelievable, it is true that driving a 125 motorbike and Mehran will cost you almost equal! In the two-wheeler, legally, you are allowed to carry not more than one individual on the pillion, but even this small car can easily accommodate at least four passengers. Owing to its smaller size and light body structure, the maintenance of this automobile falls lighter on your pocket. Spare parts are not very expensive as well as service charges, demanded by the mechanics, are reasonable. For large vehicles, maintenance often becomes unaffordable. The newly invented technology has also found its utility in this mini car brand. In the subsequent models, there has been brought improvements both in design and features. Consequently, the latest available model in the market is far better than its predecessors. Luxury has always been something unthinkable for the ordinary people, but Suzuki has perished this notion altogether. Though it will not elevate the style to a greater degree, but still one can have a fairly luxurious drive in their Mehran. Comfortable seating, spacious interior, superb air conditioning and easy drive all make it one of the most appealing yet cheapest vehicles at your hand. The famous Pakistan-based automobile manufacturing firm, Pak Suzuki was established as a joint venture between the SMC (Suzuki Motor Corporation) of Japan and PACO (Pakistan Automobile Corporation), government of Pakistan in 1983. From the very outset, Suzuki has been a people’s favorite brand and still enjoys popularity. The commercial operation of Suzuki FX started in 1984 and it got listed in Stock Exchange in the following year. After four years of FX in the market, Alto 800 cc emerged as a popular brand. 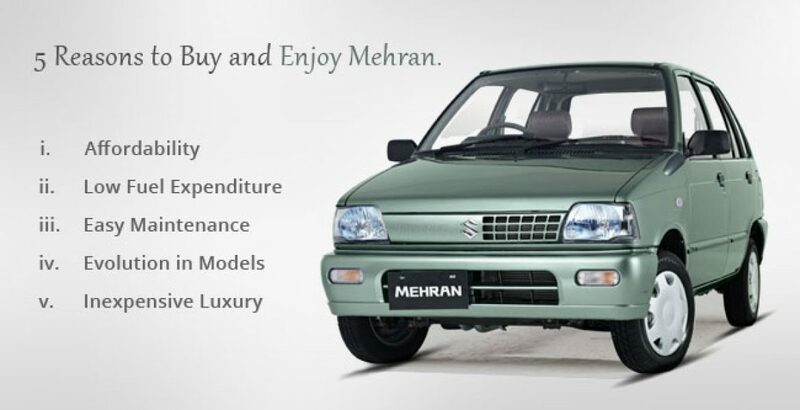 In 2012, the Euro II model of Mehran was also launched which caught the attention of all and sundry. The evolution in technology and subsequent upgradations are still on and will be witnessed in the later models.